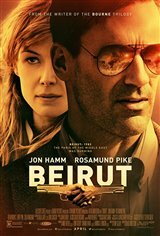 In 1972, U.S. foreign diplomat Mason Skiles (Jon Hamm) is at a cocktail party with his wife and 13-year-old ward, orphaned Palestinian refugee Karim. Just as the CIA discovers Kalim is the younger brother of notorious terrorist Rafid Abu Rajal, wanted for a number of terrorist attacks, including the Munich Olympics, Rajal's fellow terrorists burst in and nab Karim. During the commotion, Skiles' wife Nadia (Leila Bekhti) is shot dead. Ten years later, Skiles is working as a labor-dispute mediator in Boston when he's called on to travel to Beirut to negotiate a hostage crisis. His old friend Cal Riley (Mark Pellegrino) has been kidnapped, and the group of terrorists who have him have requested Skiles as the negotiator. It soon becomes clear why when it turns out the group's leader is Karim, now grown up. He thinks the Israelis have his older brother and he wants Skiles to secure his release before he'll hand Cal over.